Realizing that any fort would just be captured by the Mexicans, Sam Houston sends Jim Bowie to take the cannon from the Alamo but Bowie soon falls for the idea that the Alamo was all that stood between the enemy and Texas. Actually, what stood between Texas and the enemy was rough terrain, huge distances and winter. While the rebels were debating whether or not to declare independence, Santa Anna, the dictator of Mexico, was leading an army across the frozen ground and it suddenly appeared in front of the Alamo on February 21. Surrounded and hopelessly outnumbered, the garrison still held out for thirteen days, believing that they would be saved by a Texan army or at least receive reinforcements from Goliad, the closest fort. Surrender was not really an option since Santa Anna had announced that all prisoners would be executed but escape was possible. The script has an impressive grasp of the historical situation but the amount of facts presented may be overwhelming for many viewers. While the lead characters are not selfless paragons of virtue, many of their vices are whitewashed. No mention is made of Jim Bowie’s slave running days or the fact that he married his wife for her money. Crockett is also much less heroic in this version, coming to Texas in the hope of re-starting his political career and believing that the fighting is over. His reaction to losing his re-election campaign for Congress had been to tell his constituents “you can go to hell and I am going to Texas,” which is still one of my favorite historical quotes. Early in the movie, a scene set a year before the rebellion presents Houston and Davy Crockett in the downside of their careers, thus showing that Texas was the last chance for a lot of people. The final dawn assault is savage and terrifying, and the defenders are soon overwhelmed. Crockett’s death scene is brilliant, no fake heroism, just a man facing reality. The presentation of his final fate is controversial but the lack of clear eyewitness testimony means that it is open to debate and the scene was definitely handled well. Since the movie is about the Alamo, not the Texan revolution, the capture and execution of Goliad’s garrison is essentially ignored, even though it was a much more critical defeat than the Alamo. Instead, the story fast forwards to the Mexicans’ month-long chase of what is left of the Texan army. Unfortunately, there is no explanation of why San Jacinto was an excellent trap, nor does it show that the Mexicans were having a siesta when they are attacked. Otherwise, it is an accurate depiction of the savage bloodlust where no one was allowed to surrender. The story of the Alamo is one of the most iconic moments in American history. During the Texan Revolution, 184 rebels held out against 5,000 Mexican soldiers for thirteen days. Led by William Travis, the garrison included Jim Bowie, the famous knife fighter, and Davy Crockett, a heroic frontiersman and former congressman. 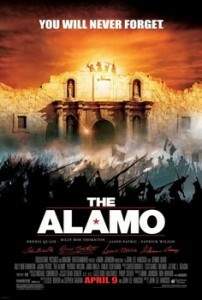 Any movie that deals with such a powerful symbol takes a great risk but The Alamo is a rousing success. It is a beautiful movie. The scene where Crockett fights the Daguello with his fiddle is simply amazing, while the nighttime bombardment of the Alamo is quite horrific. The question is why did they remain, or rather, why did the men not go over the wall one night? A surprisingly large number of movies have attempted to answer this question but John Wayne’s version made such a huge impression on people, both good and bad, that Hollywood ignored the subject for forty-four years. The popular belief was that they sacrificed their lives to buy time for Houston to build an army. CGI means that good battle scenes are taken for granted, so what sets the movie apart from the majority of bloated historical epics are two great scenes where the two living legends talk. It is clear that they understand that there is no hope but people expect things of them, which I suspect is as good an answer as any. Leadership is a key theme. Bowie, the natural leader, comes down with a disease, possibly tuberculosis, so command falls to Travis, who knows the theories but lacks the ability to inspire men. Although he has the ability, Crockett refuses to be the leader but he does tell Travis how to lead. I never felt emotionally connected to Wayne’s epic but Crockett’s little speech about how the men deserve the truth put a lump in my throat. The Mexican viewpoint receives a surprising amount of screen time. Juan Seguin, the rebels’ main Tejano ally, only works with them to fight the dictator. Santa Anna refuses to take prisoners because he fears that if Mexico’s hard-won independence is taken away their grandchildren will be ruled by the Americans. This is a nice prophetic statement, but in reality, he was far more interested in crushing any direct challenge to his power. Dennis Quaid suggested John Lee Hancock after the original director, Ron Howard, backed out when Disney refused to give him a huge budget, although he stayed on as a producer. The lack of big name leads means that the relatively modest budget was not eaten up by stars’ inflated salaries, but was spent on the set and large numbers of extras. I don’t know if it was the lack of star power or the limited size of the marketing budget, but it really did not do well in the theaters, which is a genuine pity since this is one of the better historical films that I have seen. 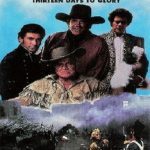 “The Alamo” raises the question of “Do all good stories make good movies?” Being as accurate as it was, there were no women as key players (though we get glimpses through flashback of Bowie’s love for his Mexican wife and the presence of Susanna Dickenson is included) and there is virtually no suspense at all as we know how it will all end. The portrayal of the key players with “warts and all” makes them more human and less heroic. I love this movie for its realism and accuracy. But ultimately it boils down to the foreknowledge that “they all die in the end”. 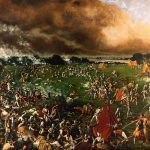 The Battle of San Jacinto coda makes a nice contrast and conclusion to the film, as well as a “happy ending” of sorts, but at the same time it feels like a round peg forced into a square hole. But why the movie failed financially as badly as it did and why the critics (except for Roger Ebert) rejected it are both mysteries to me. I think the movie’s failure, both critical and commercial, is due to its realistic portrayal of a key American event, and people could not accept it. Also, I don’t recall the studio promoting the movie very well. It is too bad, it is one of the few historical movies that is both entertaining and accurate.